Yorkies have longevity on their sides -- a great trait to pass down. The Yorkie Poo is not a breed of dog, but rather a hybrid of two well-known breeds, the Yorkshire terrier and the poodle. If you're considering bringing one of these furry cuties into your life, some knowledge of health ailments that are common in them can go a long way. Some people might erroneously believe that mixed breed dogs, due to "hybrid vigor," are somehow exempt from illness and health problems, although that couldn't be further from the truth. All dogs, purebred and otherwise, can experience medical issues. Just as a Yorkshire terrier can inherit a genetic condition from one of his parents, so can a Yorkie poo. Yorkie poos are often prone to the medical ailments that are prevalent in both breeds of their background. If something is common in miniature or toy poodles, then it could easily affect a Yorkie poo as well. Although Yorkie poos and other mixed canines aren't free from the possibilities of inherited medical conditions, they might have a little more protection against them. When you blend two distinct groups of genes, it often reduces the influence of the recessive genes that are responsible for certain medical woes. Keep your eyes open for signs of the various health ailments that are prevalent in Yorkies. Some big issues for Yorkies are the breathing condition collapsed trachea, the hip joint ailment Legg-Calve-Perthes Disease, the hormonal disorder Cushing's disease, the dislocation of the kneecaps, the inflammatory condition pancreatitis, bladder stones, low blood sugar and hypothyroidism. 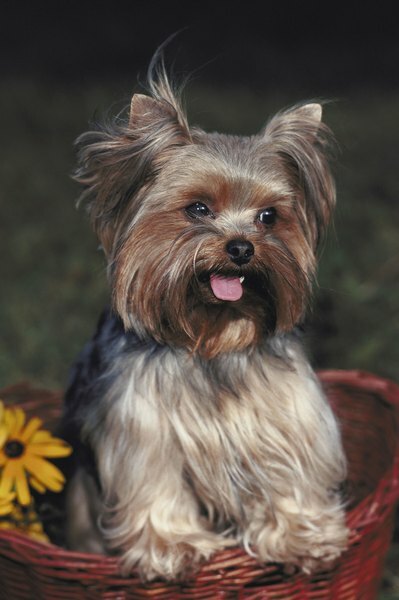 Yorkshire terriers are also especially vulnerable to problems with their teeth. As far as tracheal collapse goes, it's more common in Yorkies than in any other dog breed, and by a significant margin. Older Yorkshire terriers who are at least 7 years in age also often have progressive retinal atrophy, the genetic eye ailment. Yorkie poos are a combination of Yorkshire terriers and miniature or toy poodles. Although toy poodles are a little smaller than their miniature counterparts, they are vulnerable to a lot of the same health ailments. These include progressive retinal atrophy, tracheal collapse, Legg-Calve-Perthes Disease, the brain disorder epilepsy, kneecap dislocation and the eyelid irregularity entropion. Toy and miniature poodles are susceptible to a handful of "tiny dog" medical problems that aren't as common in their bigger lookalike pals, standard poodles. Some knowledge of the average life expectancies of Yorkshire terriers, miniature poodles and toy poodles also might be helpful in predicting how long a precious Yorkie poo might live. Yorkshire terriers are often fortunate enough to live for roughly 15 years. The average miniature poodle life expectancy is anywhere between 10 and 13 years. For toy poodles, that range is 12 to 14 years. Note, however, that all of this depends on the level of loving care and attention you provide your dog. If you make sure that your Yorkie poo gets sufficient exercise, eats a complete diet and visits the veterinarian frequently, you're on the right track for his longevity.